The official blog of V.O.Chidambaram College, Thoothukudi, Tamilnadu, India. The Postgraduate and Research Department of English organized a workshop on “Promoting Communication Skills in the ESL Classroom for Pre-service Teachers” in association with ELT@I Thoothukudi Chapter and supported by The British Council, Chennai on 17th and 18th December, 2014. The workshop was inaugurated by Dr. C. Veerabahu, Principal of V. O. Chidambaram College at 9.30 am on 17th December, 2014. 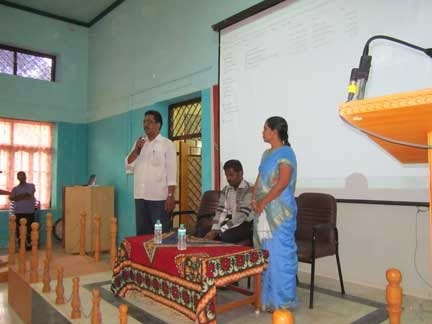 Dr. A. Joycelin Shermila, Convener of ELT@I Thoothukudi Chapter introduced the trainers: Dr. Ramani, Vice-president of ELT@I and Mrs. Uma K. Raman of British Council. Mrs. Uma K. Raman discussed ways to enhance fluency through games. She also spoke on effective role play in the language classroom and also on developing communication skills through storytelling and story making. Dr. Ramani spoke on reading and vocabulary activities. He demonstrated the interactive teaching of English grammar and also enlightened the participants with vocabulary and pronunciation activities. Dr. R. C. Vasuki, Principal of A.P.C Mahalaxmi College for Women, delivered the valedictory address at 3.30 pm on 18th December, 2014. 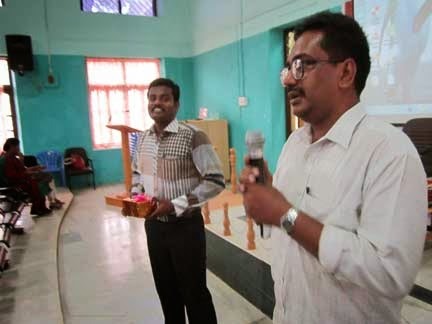 The workshop was coordinated by Dr. V. Chanthiramathi, Associate Professor of English, V. O. Chidambaram College. 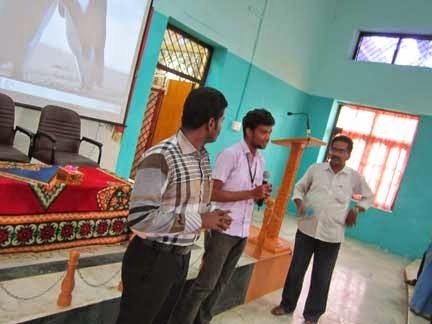 The Postgraduate and Research Department of Geology, V.O.Chidambaram College, Thoothukudi organized a two-day workshop on Petroleum Exploration on 18th and 19th October, 2014. The workshop was sponsored by Association of Petroleum Geologists (APG), Southern Chapter, and Oil and Natural Gas Corporation (ONGC), Chennai. The workshop was conducted under the Industry-Academia partnership exclusively for the students of Geology as it will enhance their job opportunities, especially in petroleum industries. The inauguration of the workshop was presided over by Dr. C. Veerabhu, Principal, V.O.Chidambaram College. B. S. Josyulu, Parton, Association of Petroleum Geologist (APG) delivered the chief guest address. Mr. P. Raja, GGM, Cauvery Basin, ONGC, Chennai, felicitated the gathering. The technical sessions and training in Petroleum Exploration was conducted by a team of ONGC experts, Mr. P. Raja, Dr. A. K. Gopinath, Dr. B.J. Goswami, Mr. J. Verma. Dr. G. Manimaran, Head of the Department of Geology, and Convener of the workshop welcomed the gathering and Dr. S.Selvam, Assistant professor and organising secretary of the workshop proposed a vote of thanks. 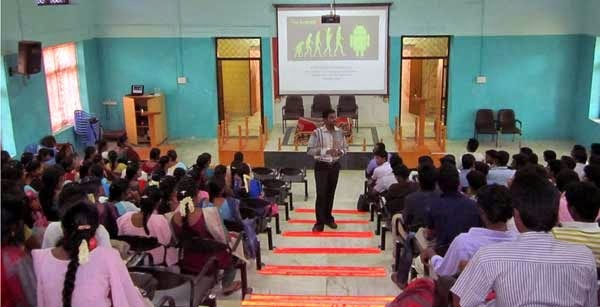 A seminar with Hands-on-Training on “Android Programming” was conducted on August-28th-2014 for all computer science department students. The head of the department - Prof.U.Kuttalingam welcomed the resource person - Mr.T.Muthu Vijaya Raja M.C.A, Asst.Professor – I.T. Department, V.H.N.S.N.College, Virudhunagar. Prof.V.Sumathy Shankar gave introduction about the invited resource person to the participants. 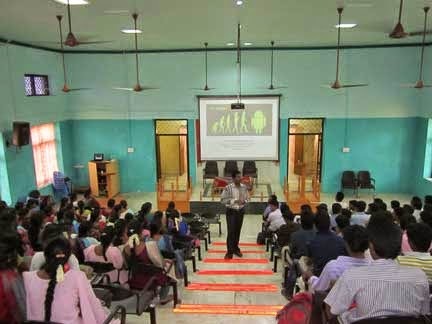 The resource person spoke about mobile application development and he gave hands on training to M.Sc.Computer Science Final Year Students. Prof. S.Gomathy Nayagam presented a memento to the resource person. Prof. U.Kuttalingam expressed his gratitude to the resource person. A seminar on “Emerging Trends in IT & International Certification Courses” was conducted on August-22nd – 2014 for all computer science department students. The head of the department - Prof. U.Kuttalingam welcomed the resource person Mr.S.Sundara Pandiyan, Director-TANDEM, Tirunelveli. Prof.V.Sumathy Shankar gave introduction about the invited resource person to the participants. The resource person spoke on the online certification exams and the recent recruitment trends in IT Field. Prof. U.Kuttalingam thanked the resource person. 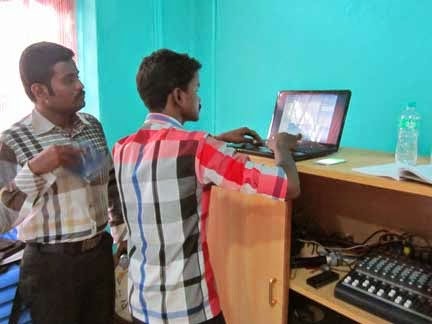 The Department of Computer Science Department inaugurated its association "COMPASS" for the academic year 2014-2015 on 25th July, 2014. Dr.C.Veerabahu, the principal, V. O. Chidambaram College, Tuticorin, presided over the function and inaugurated the association. Then the office bearers and the members took oath. Finally Prof.V.Sumathy Shankar, the president of COMPASS, announced the proposed events for the academic year 2014-2015. And she also proposed a vote of thanks. Mr.C.A.James M.Sc.,M.Ed., M.Phil- Asst.Professor, St.Thomas College of Teacher Education, Tuticorin – gave seminar on “Adolescent Crisis”. 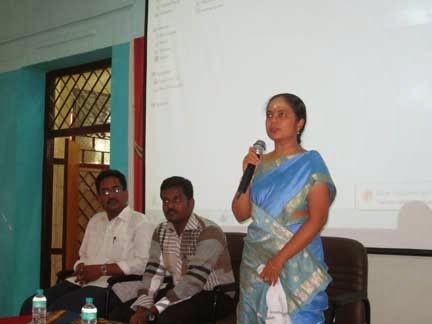 Mrs.G.Usha M.Sc.,M.Ed., M.Phil- Asst.Professor, St.Thomas College of Teacher Education, Tuticorin – gave seminar on “Adolescent Crisis & Communication Sills”. 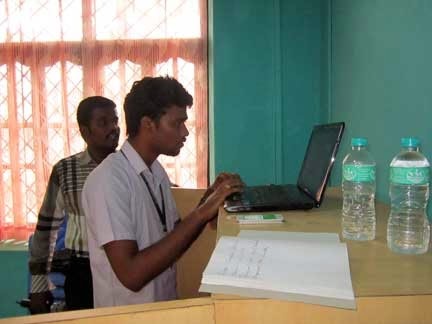 Mr.R.Resington – Director of “Can Do Automation”, the Young Scientist of Tuticorin, gave seminar on Computer Applications. The Secretary Miss. A.Gnana Bapitha proposed a vote of thanks to all resource persons. Prof. P.Iyadurai Selvaraj presented a memento to the resource person Mr.C.A.James. Prof. G.Gnana Thilagavathy presented a memento to the resource person Mrs.G.Usha. Prof. X.Jude Christo Cedric presented a memento to the resource person Mr.R.Resington. The inauguration ceremony ended by singing “National Anthem”. Copyright. V. O. Chidambaram College. Simple theme. Powered by Blogger.